“The ants go marching one by one, hurrah, hurrah!” And by ants, we mean campers. This week in our CRS program highlight series, aimed to improve understanding about the impact of donations to CRS/LAJF, we are highlighting the Wilderness/Hiking program. 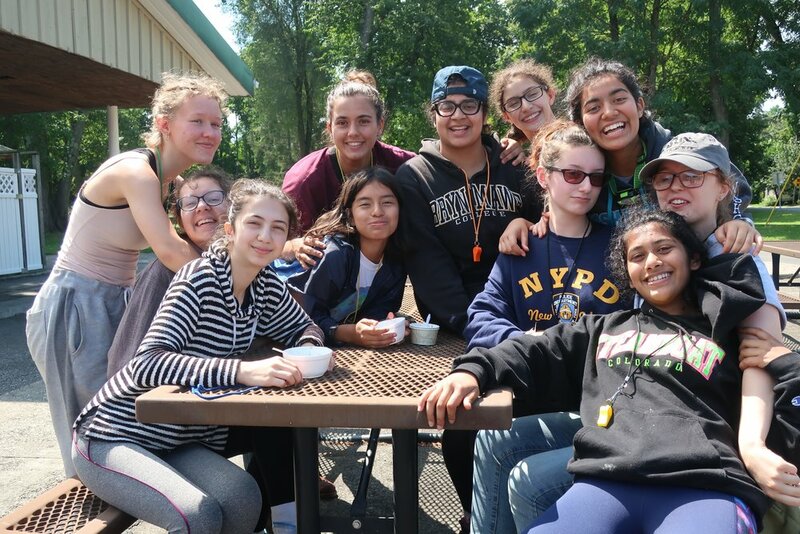 Amit Singh (‘12,‘16, ‘17), a counselor on the 2017 Wilderness Team, discusses the importance of the off-site wilderness trip, and how camping serves as an educational tool at Camp. 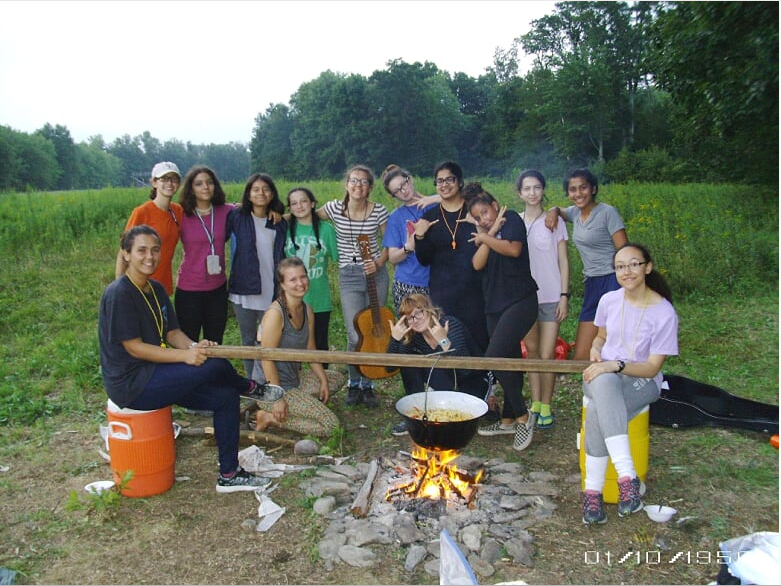 During the summer, small groups of campers embark on peer-led, off-site, overnight trips. Amit discusses how the Wilderness program was modified this year to utilize the Red Hook campus. He explains how these camping trips provide campers with unique leadership challenges not faced during a typical day at Camp, how it allows for deeper team building in small group settings, and how it connects campers to the history of CRS. During the 2016 season, when I was the Science, Technology, Engineering and Math (STEM) Counselor, I volunteered to go on one of the hiking trips. I volunteered because the hiking trip was one of my personal highlights of camp when I was a camper and thought it would be a great way to connect with some of the campers. I had a wonderful time over the trip, the hiking group sang the Ants Go Marching and other classic camp songs over 50 times. Seeing the group overcome the physical challenge of the Catskills and bond over the bonfire at dusk made it all worth it. This trip inspired me to apply to be a part of the hiking team the next summer. During the off-season, it was decided that we would try something different in 2017. Instead of going hiking in the Catskills, we would go on an overnight wilderness retreat at the Red Hook campus. I really liked the idea and thought it was a good way to utilize the unused Red Hook campus. When selected to be a part of the Wilderness retreat team, we were given the task of creating a new program area from scratch. Since we would no longer be hiking we had to find a way to fill all that time. 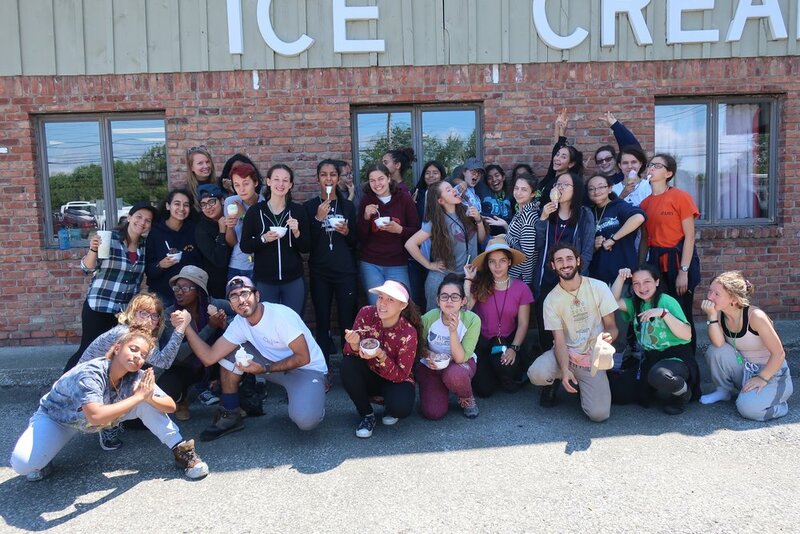 During staff training, the team took several trips to Red Hook to scout potential camping sites, brainstorm activities and organize the logistics of what the trip would consist of. The team decided that on the first day we would have a full camp tour of Red Hook, followed by some time to plan the scavenger hunt that would happen the next day. For the scavenger hunt, we bought special GPS’s which would allow the campers to map the vast trails of Red Hook. They used the coordinates from the GPS to hide clues and a token for the opposing hiking group to find. We took full advantage of Red Hook, using the Saw Kill as our water source and camping close to the Observatory, the Hogan and on Fire Road. In addition to the GPS’s we also bought new water filters and new tents since the old ones were falling apart or were broken. Overall, the trips were a success! Although the trips lacked the physical challenge of hiking, the mental challenge was still present: there was no access to bathrooms, running water or any other amenities. We cooked all our food over open fires, collected wood from the surrounding areas, and used the Saw Kill to water-cool the fresh produce. Personally, I think the biggest advantage of this trip was that the campers got to experience Red Hook, and it was no longer this mystical place that the counselors talked about. They got to walk up tent hill, see the Council Ring and ring the bell for all to hear. Seeing campers at Red Hook once again, I had to step back and just appreciate what I saw. I hope that in upcoming years the Wilderness program area will find other creative ways to give the future campers a personal connection to Red Hook. I would like to give a special shoutout to the other members of the hiking team; to Ammi, thank you for all your hard work, your passion and enthusiasm motivated me to keep going and to Katri, thank you for always being there for the team with your positive and selfless attitude. We couldn't have done it without you. The Wilderness program is one of the largest program areas budgets. It accounts for the high costs of backpacking equipment and other supplies, as mentioned by Amit above, which is necessary to keep our campers safe. Donations to CRS help off-set costs that would otherwise be placed on the campers, including, but not limited to: specialized hiking equipment and proper camping supplies like hiking boots, sleeping bags, rain gear, tents, water filters, wool socks, etc. Having a stock of functioning equipment makes for safe camping and means that campers do not pay extra for expensive hiking equipment, as they may use it only once. Campers enjoyed the hiking trip as much as Amit did. They wrote about their experiences in the CSR TIMES: CRS ‘17 Week 3 blog posts this summer. Be sure to check out the video included in that blog post.